Southwest Airlines is backfilling around 200 daily departures that its 34 MAXs—North America’s largest MAX fleet—flew prior to the grounding. The airline, which is adding MAXs for growth and to replace older 737-700s, has been canceling about 150 flights per day and shuffling the remainder of its 750-aircraft fleet to operate the rest. It is modifying its schedule daily and attempting to give customers at least five days’ notice when flights are canceled. United Airlines operated about 40 daily departures with its 12 737-9s. “Through a combination of spare aircraft and rebooking customers, we do not anticipate a significant operational impact,” the carrier says. Alaska Airlines has 32 MAXs on order but has not taken delivery of any. Air Canada has pulled the MAX from its schedule until “at least” July 1 and reshuffled its schedule and aircraft assignments to accommodate the capacity reductions. Its 24 MAX 8s accounted for about 75 of the airline’s 1,600 daily departures. The MAX grounding has forced Air Canada to make significant schedule changes. Among them: suspending flights between London Heathrow Airport and both Halifax, Nova Scotia, and St. John’s, Newfoundland. It also retimed its Toronto-London route to the evening and cut frequencies in a number of markets. In some cases, it is upgauging to maintain capacity. Toronto-Vancouver daily frequencies saw three MAX flights cut and one 777-300ER added, for a new total of up to 10 daily departures. 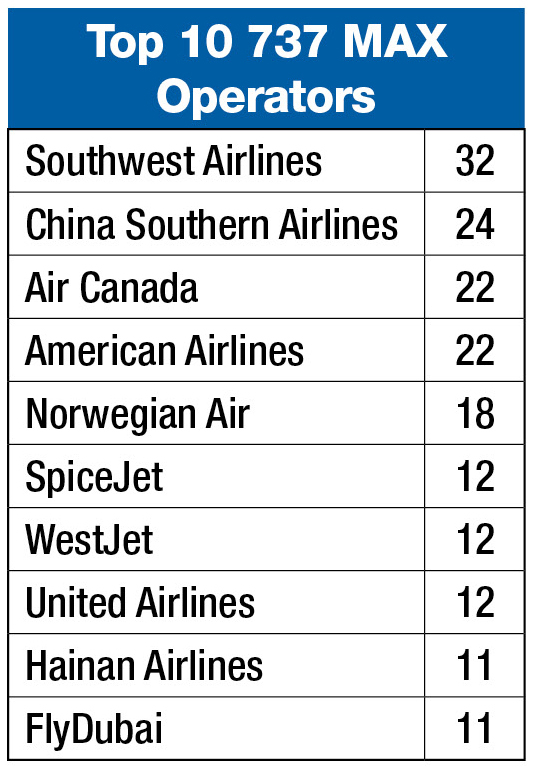 The airline listed 25 routes affected by the MAX grounding. The crisis also led Air Canada to suspend financial guidance for 2019 until it has more information. WestJet, which grounded its 13 MAXs within an hour of Canada’s March 13 operations restriction, also suspended financial guidance. But the carrier has needed fewer changes to cover for its out-of-service fleet. It is benefitting from recent entry into service of two 320-seat Boeing 787-9s, which are being used on the airline’s Calgary, Alberta-Toronto route until their international entry into service in late April. This has given WestJet some extra capacity. It also moved a 767 to the Calgary-Hawaii market that was being flown with a MAX and canceled certain flights. Its MAX operation supported about 35 daily departures. Sunwing Airlines, which voluntarily grounded its four 737-8s on March 12 because regulators in several of its destinations had banned operations, reworked its schedule to accommodate the move. An upgrade to the MAX Maneuvering Characteristics Augmentation System (MCAS) flight control law is expected to be ready in the coming weeks (see page 16). But Canadian carriers will not be cleared to fly until the country’s regulator, Transport Canada, validates the changes, Transport Minister Marc Garneau said March 18. This mirrors the European Aviation Safety Agency’s planned approach. Both Canada and the European Union have bilateral aviation safety agreements with the U.S., and normally work done by one regulator is accepted by the other. Deeper scrutiny over how the FAA handled the MAX’s certification—and the aircraft’s MCAS flight-control law specifically—is leading to more independence among regulators. With their MAXs grounded since March 12, European carriers are scrambling to find replacements to shore up their schedules. Flag carrier LOT Polish Airlines, which has five 737-8s and seven on order, has called on Slovakia-based aircraft, crew, maintenance, insurance (ACMI) specialist Go2Sky, which is providing three of its Boeing 737-800 fleet on a wet-lease basis to ease any LOT schedule disruptions. Go2Sky’s aircraft have an all-economy, 189-seat capacity; the Slovak airline is also providing six crews. “The MAX ban in Europe has triggered a serious lack of capacity in an ever-growing market, with demands on available aircraft increasing every year,” Go2Sky CEO Daniel Ferjancek said. Norwegian Air Shuttle will seek compensation from Boeing over the grounding, according to the low-cost airline’s CEO, Bjorn Kjos. In a video posted on Twitter, he said only a small part of its operation is affected—about 1% of seat capacity. But he added: “It is quite obvious that we will not take the cost related to the new aircraft that we have to park temporarily. We will send this bill to those who produce this aircraft. . . . What happens next is in the hands of European aviation authorities, but we hope and expect that our MAXs will be airborne soon.” Norwegian said it would temporarily deploy a Boeing 787-9 on U.S. flights from Dublin as part of efforts to minimize disruption by reallocating other aircraft, rebooking passengers and combining flights. Ryanair CEO Michael O’Leary said on March 11, before the widespread groundings, that the carrier had no immediate plans to change its delivery schedule of one aircraft in April, two in May, two in June and 50 more before summer 2020. TUIfly, a German leisure airline, was due to take its first two 737-8s in March and a total of six by year-end. Scheduled MAX flights were due to start on April 14 from the airline’s Hanover base. In Indonesia, flag-carrier Garuda Indonesia and Lion Air say they are reconsidering their MAX orders. Garuda President Director I Gusti Ngurah Askhara Danadiputra says the airline “lost confidence in the model following two crashes” and is in talks with Boeing for the potential cancellation of the remaining 49 737-8s on order. Garuda’s first and only 737-8 has been grounded since March 11, under orders by the Indonesian transport ministry. Garuda was to take delivery of the remaining 49 aircraft through 2030, part of a 50-aircraft deal signed in 2014. Lion Air also considered canceling its order of over 180 aircraft, replacing them with more Airbus A320neos. It already has 113 A320neos and 65 A321neos on firm order. The airline is still studying the legal options and says it has suspended the delivery of four 737 MAXs due for this year. Lion Air had made similar threats in December 2018, following the crash of its MAX operating as Flight 610 and disagreements between Boeing and the airline over responsibility for the incident. The group has both the 737-8 and -9 in service, also flown under the Malindo Air and Thai Lion Air subsidiaries in Malaysia and Indonesia, respectively. This entry was posted in News and tagged 737, Airlines, Boeing, Grounding, Impact, Max, Minimize, Struggle. Bookmark the permalink.